One of the most effective and simple bird deterrents for large open spaces (for example roofs or loading bays) is bird netting. The netting prevents all species of urban birds, including the most prevalent such as pigeons and seagulls, from nesting or perching on your property. This dramatically cuts down on bird droppings. To get a free quote for having bird netting installed on your property by professional pest control technicians, get in touch with PestControl.co.uk. With most pests, the solution is simply to get rid of the infestation. This is not practical when it comes to birds since they are not concentrated in one area. Instead, therefore, bird deterrents are relied upon. There are a number of different kinds of bird deterrents, each of them with their own advantages. Our pest control technicians will be able to advise you on the best option for your particular situation when they survey your site. Discretion. Bird netting is not noticeable, especially if it is on a roof and you are at ground level. This means that you will not be compromising the aesthetics of your property. Covers large areas. Many bird deterrents only protect small areas from birds perching and nesting. However with bird netting you can keep birds off large areas, typically a roof. Long-lasting. The bird netting from PestControl.co.uk is specially constructed to be resistant to most environmental conditions making them last for at least ten years. 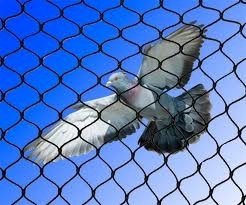 The theory of bird netting is very simple, it prevents birds from landing on areas that it covers. This means that the birds will be unable to perch or nest on the protected area. This will also drastically reduce the amount of guano that your property will accumulate. 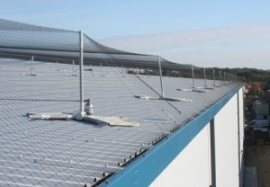 The bird netting from PestControl.co.uk is installed using a stainless steel perimeter, supported by fixings which keep the netting elevated. This creates a very strong structure. The bird netting itself is rot proof and chemically inert. It is also resistant to most chemical and environmental conditions. It has been treated to make it resistant to the harmful effects of UV rays, and prevents ice and snow accumulating on it by raising the freezing temperature of any water which lands on it.